I’ve been looking forward to this story, as you may or may not know K.A. Tucker’s Ten Tiny Breaths was my favorite, number one book I read in 2012, the tops out of 396 books, so I had great expectations, but I was also worried about the sophomore slump… no need to worry, this book was just as amazing. Many thanks to Netgalley who provided me with a galley version in exchange for an honest review. We pick up the story some time after life with Kasey has settled down, and now it’s time to follow Livie’s story. She’s grown up, finished high school and is on her way to Princeton, to fulfill her life long dream of being a doctor, and helping kids fight cancer. Dr. Stayner is still involved in the girls’ lives and challenges Livie to embrace freedom and college life, to taste it all. College is a wild and crazy place, I should know, I work at one. This life is shell shocking to our little Livie who has been a shy reserved girl her whole life, repressed really in so many ways. In bringing her to Princeton Kasey makes it her mission to help her sister live life more fully, to walk on the wild side, so she and Livie’s new roommate Reagan drag our sweet girl off to party. The party is a pivotal time in Livie’s life, she gets crazy drunk and mayhem ensues, and of course she meets the campus bad-boy, Ashton. There is the inevitable morning after, hangovers, tattoos and a nickname, Livie is now Irish. Although fascinated by this bad-boy he’s got a girl back home and a hundred others in his room, so not what Livie needs. He isn’t her picture of her future and happiness but she does meet the perfect part of that picture Connor, who happens to be Ashton’s roomie and bestie. You could palpably feel the awkwardness of it all. Through classes, and parties and volunteering Livie struggles to figure out who she really wants and needs to be. Connor is perfect, and the perfect boyfriend, but there’s something about Ashton, something running deep which draws Livie to him time and again. K.A. 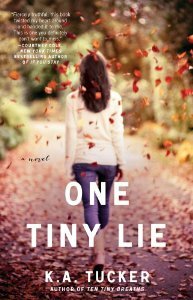 Tucker weaves a beautiful tale of Livie’s coming of age and figuring out who she is and who it is she wants to be. It is a wild and emotional ride and I couldn’t put it down. Pick it up, I’m positive you will love it. Kudos K.A., another amazing story.